now, i'm sure i have about a million things that i really MUST write about, all week long things pop into my head and i think, "damn, forgot to mention that again" or "have to fit that into the next blog post" but now that i finally have moment to write, it's all a bit blank up there. so show and tell, it is. i've finished off my mini quilt for the Down Under Doll Quilt Swap and now have it wrapped up and ready to send off on Monday. 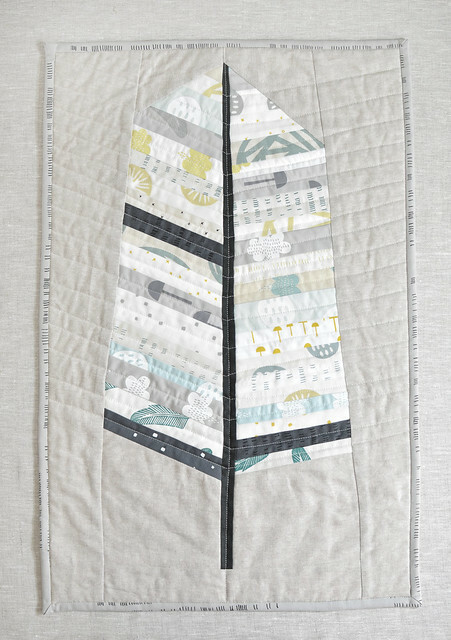 the feather piecing is inspired by an amazing quilt Anna Maria Horner did for the last quilt market - she now has a free pattern available for the feather blocks but i made this up a few weeks before that was released so my shape is a bit different. i'm a bit sad to see this little quilt go but soooooo excited for it's new owner to open the package, i think it's going to a place where it will be much loved (fingers crossed). and looking forward to seeing what we receive as part of the swap (i asked for something the girls can use as a doll quilt). i also finished the custom order chair cushion for a lovely lady in the UK. it is sixteen inches square and i used three layers of organic cotton batting for a bit of extra padding. the batting didn't effect the quilting too much but it made the binding much more challenging. still, very happy with the way this piece came together, it was great fun to do some small scale freeform piecing again, it has been awhile. 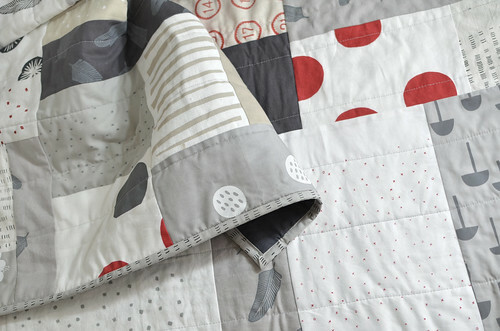 and i finally finished off the single size red + black + white + linen quilt that i started a few months ago. it's pieced with scraps and misprints, in a colour palette i don't normally use (namely red) but i'm digging the graphic nature of the final quilt. 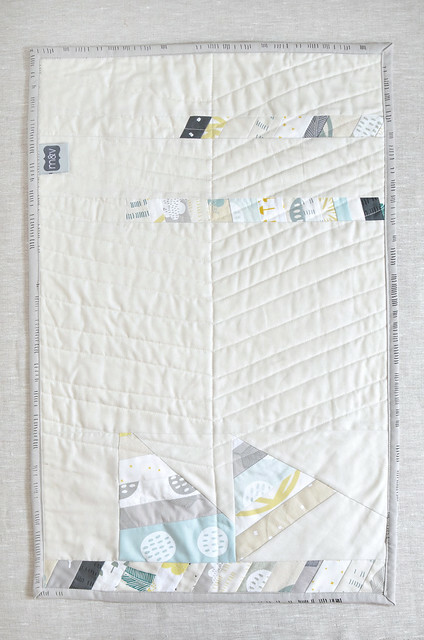 i used a high loft cotton batting that i ordered from hancock's of paducah last time they had a free shipping event so it's nice and cushy, slightly weighty but i like that in a quilt. 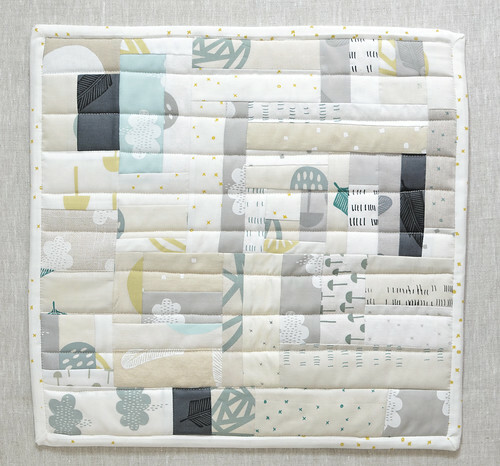 I love your quilts so much. I'm curious how you go about your freeform piecing. 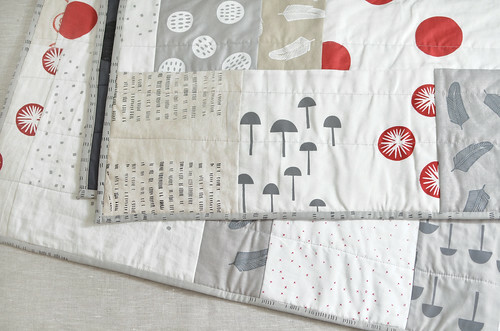 Love them all - love anything in your fabrics! Ooh, obviously haven't popped by here for awhile. I love these!